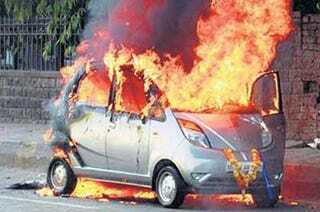 The Tata Nano, the cheapest car in the world, is awash in bad press after four brand-new cars have caught fire in India. Is Tata about to become the Indian Toyota? The most dramatic of the four incidents occurred yesterday as a new owner was driven home by a chauffeur (the owner hasn't yet learned how to drive) provided by the dealer. 45 minutes after setting out, a motorcyclist warned the Tata's occupants of smoke billowing from the back of the car. They dove out of the moving car to safety, only to watch the Rs 2.4 lakh ($5,275) car engulfed in flames. This latest incident follows three similar ones that occurred last year, with owners reacting to the fires in a very unintended acceleration-like way. "I had bought the car for my children and they are now terrified of driving it, want the company to refund my money and take back the vehicle," said one affected owner. "I bought the car because Ratan Tata drove and introduced it. I thought this small car will be convenient for daily use in the city. Now, I feel it is better to drive a big car. Even if I get a replacement, I will not accept it," said another.